I love French fires but all that oil gets to my stomach so I was always looking for an alternative. Rachel Ray gave me the idea I just change it up depending on what else I am cooking. Might as well make them complement my main meal right? 3 medium russet potatoes washed, scrubbed and dried. I have used sweet potatoes are good but they do not keep their firmness. You can use any potato you want, some will work some won’t. Leaving peel on, cut the potatoes lengthwise, about 3/4-inch to 1-inch wide. Combine the potatoes, oil, salt and your choice of herbs on the baking sheet and toss to combine. Arrange the potatoes on a baking sheet in a single layer, but evenly spaced so the potatoes aren’t touching. Bake until golden brown and cooked through, about 30 minutes turning over about ¾ through. I have read some recipes that say that if the skin side is on bottom last they come out better but I just spread, bake and turn. 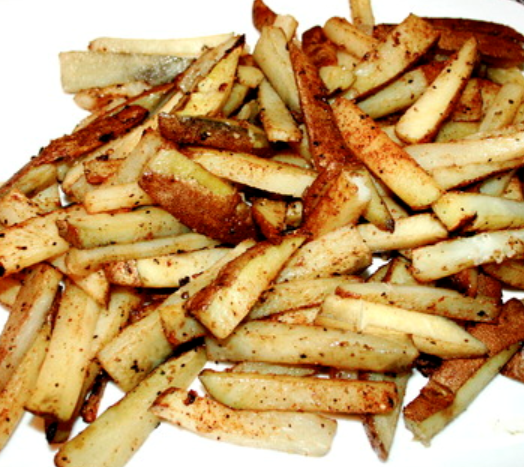 This entry was posted in Baking, Potato, Side Dish and tagged French fries, Potato. Bookmark the permalink. ← Spicy Blue Potatoes & Corn Salad.